Mongla port, the country’s second largest seaport, has turned into a profit making entity in recent years with increasing number of ships using the port. Earnings from the port also increased substantially in recent years, port officials told Daily Sun. The port made an all time record in foreign ships’ entry in November last with pulling in some 80 ships. The number increased further to 87 in December, 2017, said the officials. The total number of ships using the port rose to 623 in 2016-17 fiscal year from 482 a year earlier. In the previous three years the numbers were 416, 345 and 282 respectively. At the same time, the port started seeing profit since the present government assumed power in 2009. The authorities put special importance and took various initiatives to develop and modernise the port, officials added. Last year the port was able to make a profit of Tk 73.25 crore, up from Tk 64.73 profit a year earlier. In the previous three years, the port’s total profit were Tk 60.69 crore, Tk 53.62 crore and Tk 43.95 crore. Port officials said Mongla port faced various challenges during 2001-2008 period and became a loss making entity in 2004-2005 fiscal year when total ship entry slipped to only 95. 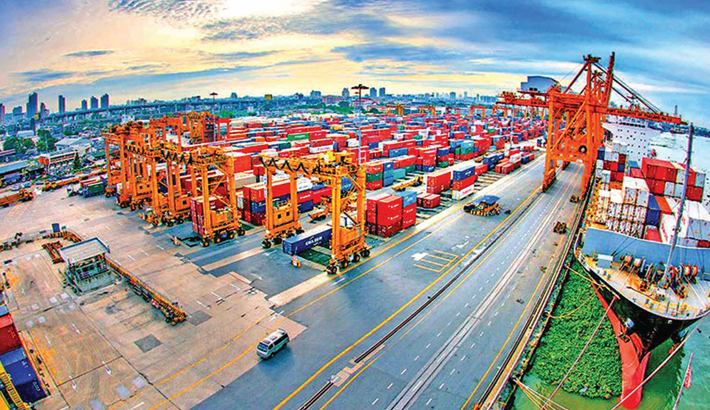 Following some development initiatives and a greater attention from the government, the port gained momentum and its activities also increased manifolds, which was reflected in record presence of foreign ships, informed Mongla port officials. “Mongla port is now moving forward. This success has been achievied because of farsighted development plan of the incumbent government,” Commodore AKM Faruque Hassan, Chairman of the port, said. He also gave credit to shipping ministry, better port management and efforts undertaken by the port staff for the success. At present, 34 foreign ships have already anchored at port jetties and at different outer points, the port authority informed. The volume of total cargo handling in the port more than doubled to 75.11 lakh metric tonnes in 2016-17FY from 31.47 lakh metric tonnes five years ago. The port’s cargo handling gradually marked a sharp rise after 12-13FY. In the next fiscal year the volume was 35.43 lakh metric tonnes, 45.30 lakh metric tonnes and 57.96 lakh metric tonnes. Mongla port was set up in 1950 during Pakistan era, eying to enhance regional trade with East-Pakistan. Mongla is connected to most major ports in the world, particularly Asian ports. Hundreds of ships use the port each year, most of which come via Singapore, Hong Kong and Colombo. Mongla is also connected to most inland ports in Bangladesh, including those in Dhaka. Following a coastal shipping agreement with India, Mongla has a direct shipping route with the ports in Kolkata in the neighbouring Indian state of West Bengal. A coastal shipping agreement has also been signed with Thailand.